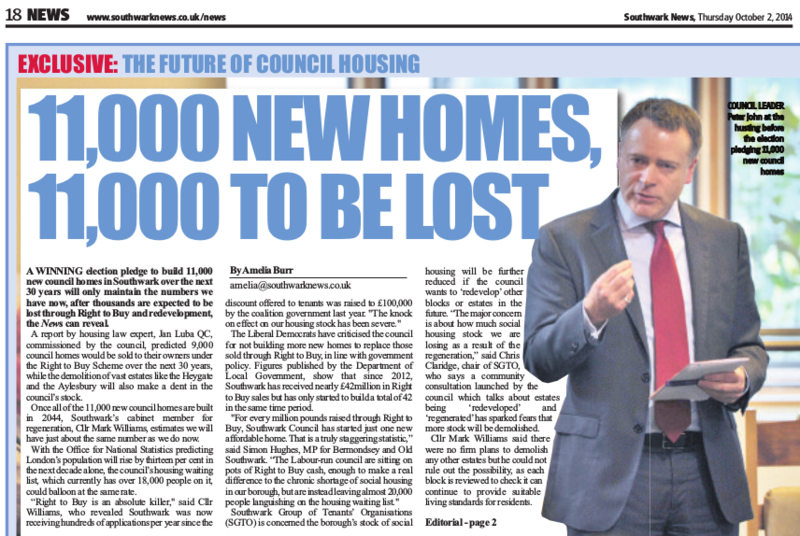 In 2014, as part of its manifesto pledge Southwark Council’s administration announced an “ambitious but realistic plan to build 11,000 new council homes” across the borough over the next 30 years. Concerns were raised by us and in the local press that this would fail to make up for the thousands of council homes currently being lost to ongoing estate regeneration, void disposal policies and Right to Buy applications over the next 30 years. Four years on and we have taken a look at whether Councillor John has delivered on his manifesto pledge. 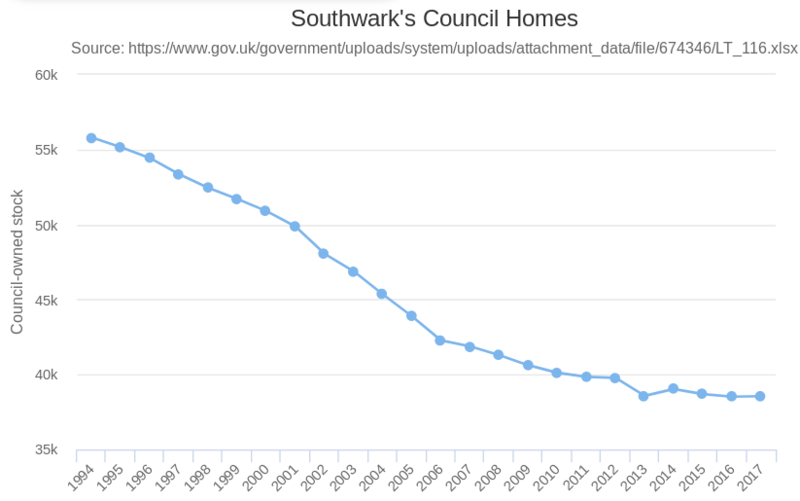 Official statistics from the government’s live tables on local authority dwelling stock show that since the manifesto pledge in 2014 there has been a net reduction in Southwark’s council housing stock of 476 council homes. The figures aren’t saying that Southwark hasn’t built any new council homes, only that the rate at which is building has not kept up with the rate at which it is knocking them down and selling them off. The Council has or will demolish over 7,500 council homes as part of regeneration schemes, including 1200 council homes in the Heygate estate regenerationand circa 2400 on the Aylesbury estate. In addition, it has sold 1300 council homes under the Right to Buy since 2012 and has an ongoing policy of selling every council home that becomes vacant which is valued at £300k or more. Meanwhile, this 30th Oct 2018 Cabinet report confirms that the council has built just 262 council homes over 5 years (para 12). The Cabinet report confirms that an additional 239 units of developer-built (S106) affordable housing have been bought by Southwark, to become council housing (para 17). One such example is Blackfriars Circus, where the Council has bought 56 homes for £10m from developer Barratt. A problem with this method of buying council housing is that it does not actually increase the net supply of social housing – the same units would otherwise have been bought and let by a housing association anyway. 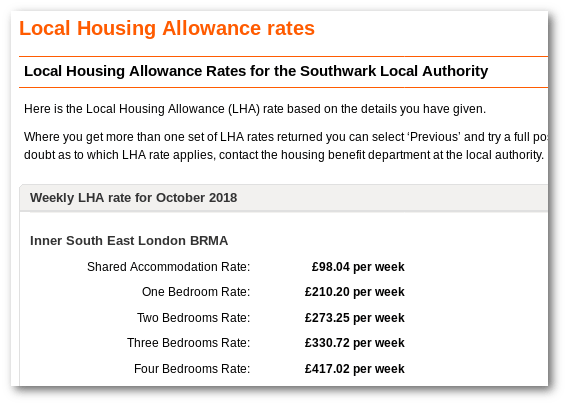 Further, Southwark is denying itself the benefit of the S106 contribution, by paying for something a housing association would have paid for anyway – and, rather perversely, denying itself funds for building units that would actually increase the net supply. It is also not clear whether all the new homes have been let at council rents. We have blogged previously about new ‘council homes’ now being let at a percentage of market rent (40%) rather than social rent (which is currently approx 20% of market rent). In any event, 112 of these new ‘council homes’ are temporary accommodation units in hostels (Willow Walk – 75 units, Good Neighbours House – 37 units) and are let at LHA rent levels, which are more than twice current council rent levels.